The Brooklyn DA is seeking hate-crime charges against a Chinatown man who attacked a Falun Gong practitioner with a steering-wheel locking device. Victor Yau, 60, is accused of smashing software engineer John Yu, a devotee of the controversial Chinese spiritual movement, in the hand on June 15 in Sunset Park. The clash followed weeks of simmering unrest between Falun Gong practitioners and critics in the city's Chinese-American communities. 2. Brownstoner.com posts that the funny-looking office building (just up the block from the GreenWalk condos) with confusing "smoker balconies" is finally ready for leasing. 3. Sunset Park doesn't seem to have any problem renting out apartments, even for a fairly attractive penny. This apartment, posted on June 27th and available for viewing on the 28th, has already been rented out. Of course, the infamous condos of 46th Street are still available for rent/for sale. Lend Me Wire Cutters, Please. 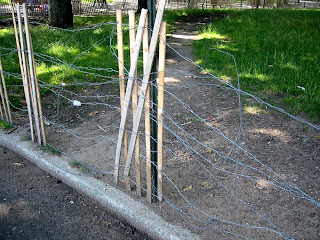 The photos show today's condition of the fence outside the Sunset Park Playground entrance. The photos don't do it justice. You can't make out the spiky ends and sharp, curled tentacles waiting for an eager child to pass by. Just about two weeks ago I made my first complaint about the "fence" at the back entrance to the playground in Sunset Park. I was met with concern and creased brows and frowns about the situation. "Oh yes, that's a problem. Yeah, that's a safety issue." Sadly, not enough of one to prompt action. 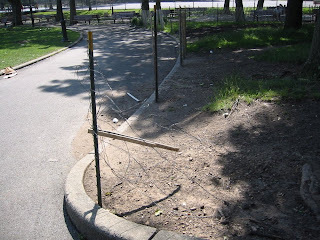 Anyway, that's what I was hoping for this morning when I called 311 to report (again) about the destroyed but dangerous fence outside the Sunset Park playground entrance. 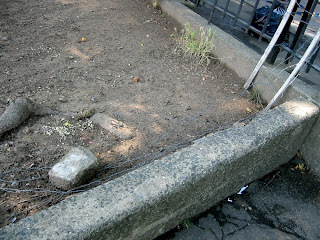 It used to be a fence to help grass grow - a less than successful endeavor. However, it has been very successful as a safety hazard. The operator told me that it takes up to 14 days for service requests to go through. Anyone have wire cutters that I can borrow? 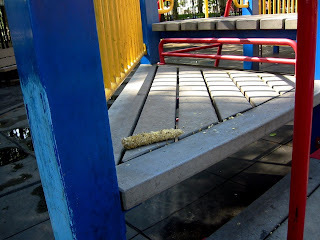 A commenter on GL pointed out that parents could organize a group of volunteers (like Carroll Park has) to stay on top of major concerns and show active interest in the condition of the playground. 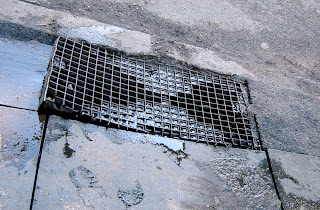 Another suggestion is to call 311 to report specific condition issues. Unfortunately, LICH has so many money issues plaguing it lately that I doubt it will step up concerning the playground unless it has to. The parents will need to be active, and they might even need to get their hands dirty. Ewww! 311 can be a long telephone call, but sometimes it actually prompts action. I have made my morning call to 311 (see next post), now it's someone else's turn. On July 1st, at 8 PM, Light Industry's Tuesday evening presentations continue with a show curated by musician and visual media curator Nick Hallett. Its title is borrowed from Paul Simon's gift to Leonard Bernstein for 1971's Mass: "Half of the People Are Stoned and the Other Half Are Waiting for the Next Election." 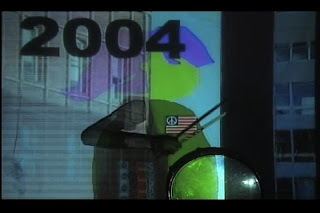 The presentation is described as "a screening of activism-oriented video, performance documentation, and new media from 2004." As always, it costs $6, and it runs approximately 80 minutes. For the full list of the works included, go to www.lightindustry.org. Barbacoa y Consomme de Chivo is number six on yesterday's Daily News' list of "Great Street Eats," and even though it's only on the weekends, it has a very loyal following. Of course, you have to love goat to enjoy the best dishes. Try it out and let this vegetarian know how it was. Children ages 5-8 and 9-12 can register for Baseball at the Sunset Park Recreation Center at 43rd Street and 7th Avenue. They must be a member of the Center (free to anyone under 19), and they should bring a COPY of their birth certificate. For more information, call 718 965 6533. Sunset Pool is Popular Even When Rain is Imminent. Despite occasional sprinkles during the break time (3-4 PM) before the second session on Saturday, the line was long, patient, and determined. Soon after this photo was taken, the rain began in earnest, and the pool afternoon idea had to be abandoned. Today looks much more promising, but since scattered thunderstorms are promised, the second session might also be scrapped. Hopefully not! At a little past 9 AM on Saturday we encountered a young man who was first in line for the first session (at 11 AM). He said that the pool was cold, but "awesome." He said that since it would be packed, he was making sure he got a good locker and a chair. I hope he got what he waited all that time for! 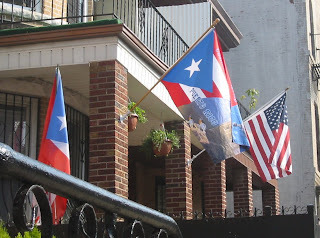 On Saturday, take advantage of the Boricua Festival moving to the 58th Street Pier. Enjoy music and culture and fun from Noon to 7 PM. 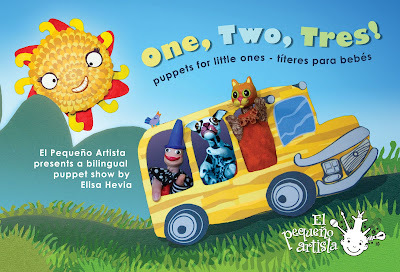 On Sunday, take the under five crowd to El Pequeno Artista for a bi-lingual puppet show. Sunset Park Pool Opens Today! It's the first day of summer (if you're school-age), and the Sunset Park Pool is ready to go. Yesterday life guards were checking out the pool with long-handled tools and sharp eyes. The barriers have been set-up. The new blue signs have been posted. The staff is bracing for an onslaught of eager children and adults. And today is the day. The regular pool hours are from 11 AM -3 PM and 4 PM - 7 PM. I suggest the early session if you plan on bringing a baby or toddler. The later afternoon session can get a little wild. Adult lap swim beings July 7th; the hours are 7 AM - 8:30 AM and 7 PM - 8:30 PM, Mondays through Fridays. Here are the rules for using the City's Pools. Make sure you're not turned away! Bathing suits must be worn on the deck and in the water. Men’s bathing suits must have mesh linings. Hats may be worn on the deck for sun protection but are not allowed in the water. Plain white T-shirts may be worn over bathing suits if desired. Sneakers are not permitted. Rubber flip flops or water shoes are permitted. No urinating or defecating in the pools. Children under 16 must be at least eight inches taller than the maximum water depth to enter the pool without adult supervision. Specific height requirements are posted at every pool. No person will be permitted in the pool having: skin lesions, sores, or inflamed eyes, mouth, nose, or ear discharge, carrying communicable disease or having any type of bandage, adhesive tape, etc., on their body. All bathers must take a shower in the locker room before entering the pool. Patrons must provide their own padlock. No responsibility is assumed for lost articles. A standard master or combination lock is recommended. Small luggage locks are not permitted. The use of swimming aids, water toys, and flotation devices is prohibited. Electronic equipment, including radios, cameras, and cellular phones, is not allowed on pool deck. Eating or drinking is permitted only in designated areas. Alcoholic beverages are prohibited. Beach chairs, baby strollers, bags, blankets, or beach balls are not permitted on the pool deck. We will make our best effort to secure strollers. Follow the directives of lifeguards, Parks staff, and the police. Ball playing, running, jumping, using profane language or other forms of disruptive and disorderly behavior are prohibited. No diving, except in designated areas. No smoking, pets, or glass bottles permitted. Books and bound periodicals are permitted on the pool deck. Newspapers are not. Do a lot of residents have to deal with all these problems? I think that this person may have incredibly bad luck when it comes to choosing which neighbors to settle in with. She (I'm not sure about the gender, but I'm guessing) said she's had to deal with: harassment while walking her dogs, slashed tires, keyed doors, arguing over parking spaces and loud music, sanitation tickets due to passersby adding to the trash, and today - the kicker - someone throwing unknown edible material into her yard...and her dog ate whatever it was. Check out the Brownstoner link for the details and an unusually calm bunch of commentary. According to a poster on Brooklynian.com, a man knocked on her door at 11:15 PM last night asking for money to buy asthma medicine for his daughter. Sounds fishy, no? 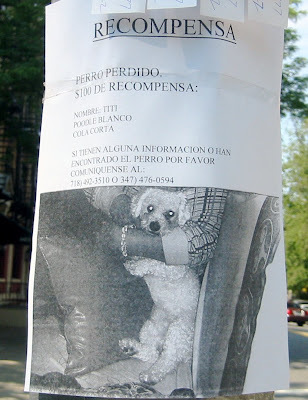 Well, the poster turned him away, but he may stop by to other households in Sunset Park. So, be aware of people pulling at your heartstrings. Here's the original post, if you're interested. Need a reason to Say Something if you See Something? How about a reason to stay vigilant and active in your neighborhood and on your block? The Bay Ridge drug bust, in houses often referred to as a Crack Dens by locals on various message boards, is featured in today's New York Times. 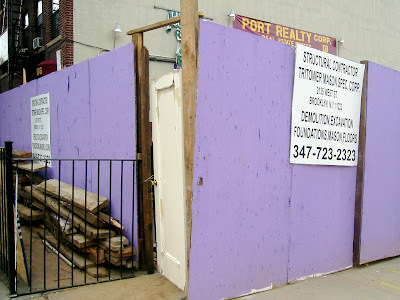 Credit is given to the Discussion Board BayRidgeTalk.com for bringing attention to the 93rd Street houses and its nefarious activities. As descriptions of crack houses go, the ones the bloggers gave of the homes on 93rd Street were hardly novel, with stories of addicts slumped on the steps outside and cars coming and going at all hours. Men inside chased strangers away, neighbors said, waving sticks and making threats while the rest of the street peered out behind drawn blinds. 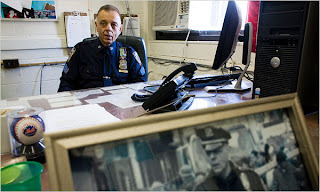 But peering turned to blogging, and blogging turned to action, as neighbors started filing complaints with the 68th Precinct station house and attending Community Board 10 meetings and generally making noise until a narcotics investigation began, leading to the arrests. Can Sunset Park residents think of anything around here that could use the same attention turned to action? Free Breakfast and Lunch is available to all children 18 and under in New York City at hundreds of schools, parks, pools and other locations around the city every weekday from June 27th through August 29th 2008. There is no payment, registration, ID, or documentation required. Children can enjoy a FREE breakfast and lunch at any open site, regardless of income or enrollment in school. The Sunset Pool program is for LUNCH ONLY: 11 AM - 2 PM. 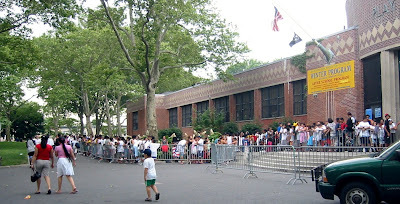 The Elementary Schools (definitely PS 1 and PS 24) and MS 136 have both breakfast and lunch. Breakfast is from 8 AM - 9:15 AM and Lunch is from 11 AM - 1:15 PM. Call 311 to find additional open sites near you. the proposed power plant for Sunset Park and outreach around the rezoning of the neighborhood. 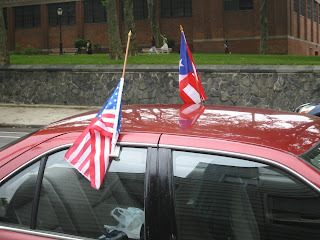 SPAN will be tabling with information about the proposed rezoning during the Boricua Festival, as well. The festival is on the 58th Street pier from Noon through 6 PM. In addition, SPAN will continue to collect signatures from residents who are against the up-zoning of 4th and 7th Avenues and who want to see low-income and affordable housing rather than luxury condos. Please come out on Saturday to show your support and sign a petition! Our library, and its Young Adult Librarian, are highlighted in The Daily News. 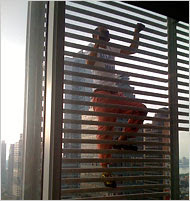 A Swiss choreographer and sometime Sunset resident gets some NY Metro attention prior to his weekend presentation. Two men allegedly wrecked a Sunset Park grocery store because they though the price of beer was too high. Digenes Perez, 30, and Hugo Roses, 28, argued with employees over the prices at the shop on Fifth Avenue at 39th Street Sunday night. They allegedly flipped over display cases and struck one of the employees with a beer bottle. They were arrested for assault, menacing and harassment. I doubt the price was anywhere near the recent WNYC Brian Lehrer findings for a 6-Pack of Budweiser. $13 at Garden of Eden? The Sunset Park results ran about $5.59, give or take 10 cents. 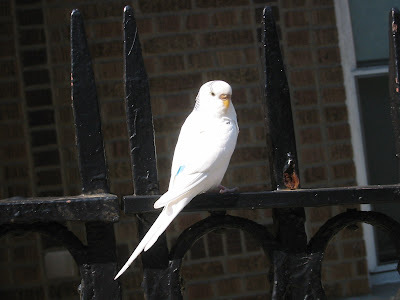 Yesterday this pet bird was flitting around the corner of 6th Avenue and 44th Street. It was pretty clear that it was tame, but it wouldn't use my hand or arm as a perch. I looked up at the three coop buildings where the bird was flying around, but I didn't see any open windows. It's a lovely bird. 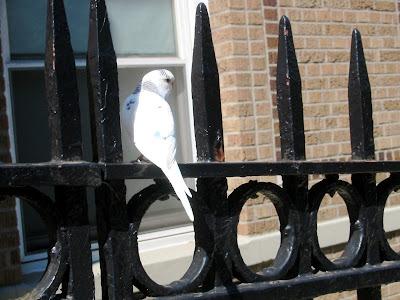 White with a bright blue spot on its back; you can see the blue when the bird takes off. Hopefully the owner(s) found it before the pigeon-killing hawk seen in Sunset Park spotted it. Petition to Put Pre-K and Kindergarten Admissions Back The Way They Were, darn it. I have mixed feelings about this. However, I believe wholeheartedly that everyone should make up her/his own mind about an issue and act accordingly. That does mean to actually read and educate oneself about a topic and not just go with "what she said." That leads to hearsay and the squeakiest wheels guiding policy changes. I'll put the link here so that those who don't want to read and/or respond to the following can just sign it and read it (not in that order, please). Anyone who pays attention to young child and/or education issues will surely have heard a few earfuls about the "Pre-K Fiasco" that has recently occurred. Most of the attention was given to younger siblings being rejected from their older siblings' schools. As it turns out, that was only about 200 children. Now, for those 200, it was and is indeed a fiasco. (How do you drop off two kids at two separate schools - sometimes quite far away - at the same time?) However, considering the numbers of school children in NYC, not so much. More disturbing to me was the lack of assistance that parents who aren't members of the Park Slope Parents listserve received. Navigating the NYC DOE is treacherous for those of us who are a part of it; for those who are disconnected from the processes and ways around the system, it's tear-inducing and teeth-grindingly painful. For the three people that care about what I think, here's my take on it. Centralizing the admissions process doesn't have to be a bad thing. It's not currently run in an ideal way, but I can imagine some (unspoken) reasons as to why the process was changed. Favoritism and "buddy favors" are common. Oh come on, don't say they aren't. Another reason might be to cut down on the fraud. Most everyone knows that addresses within zone for favored schools are sometimes "borrowed" or "purchased." Centralizing the process could eliminate the first problem and mitigate the second by noticing discrepancies in the number of applications versus the households from which they come. The petition supports giving individual schools back their control over the process. It (the petition) states that families often received two or three acceptances due to applying to their zoned school as well as lottery or magnet schools. This allowed them to choose the best option for their child. Uh, yeah. Maybe the families you know. But the same people who were out of the loop in the petition's informational "equity point" were out of that loop as well. On the other hand, I don't buy the DOE's explanation as to why it wanted to centralize it. Just admit you want control. Just admit that people are soft and flawed when they have to work face to face with those they admit and reject. The DOE could easily obtain the data about how many spaces are needed versus how many they have. And Joel Klein's explanation of not wanting parents to "camp out" or miss information is flawed as well. The first demand isn't necessarily a strong one. It pains me to say it, but it's only fair to allow the DOE more than one run of the process. This was the first go at the centralized process, and the numbers weren't as horrible as all the uproar promised. I think the second, third, and fourth points in the petition are excellent. Separate the process for the schools that are separate. Keep families informed (and I'd say make the information available to the general public as well.) And obviously, add seats where they are needed. I'd add that the process should begin earlier and include well-publicized community meetings in neighborhood languages and at different times of the day. It's nice to be able to leave work a little early without repercussions to make a 5:30 PM meeting, but what if you don't have that choice? Or what if it means you don't get paid for hours missed? Tough choices, especially these days. Pre-K and K admissions are stressful and emotional. It's a young child you're throwing into the fray, after all. While middle school and high school admissions are scary in their own way, at least the kid has been through the mill a bit already. It's no wonder people got frenzied and nervous and nutty about the hiccups in this process. It's good to be the squeaky wheel, but it's also important to look at all sides of an issue. Loudly demanding change is important, but it's also good to realize that huge corporations (like the DOE) move slowly when changing. Hopefully the results will work out to everyone's satisfaction. Hopefully it will be fair to everyone, not just those who squeak. As soon as I finished with the Bahn Mi post, another article including SP food popped up. And it's not ONLY about 8th Avenue! Yesterday's Daily News had an article about $5 food in Sunset (and other parts of Brooklyn). A stew lunch special with goat, chicken and oxtail for only $5? Only at La Isla Cuchifrito Restaurant at 4920 Fifth Ave. in Sunset Park. "I love it here. If you want good quality Spanish food at a cheap price, this is the place to come," said Sunset Park resident Sergio Ortiz. Just three blocks away, at 507 46th St., is the yummy Taco Mix eatery, offering a $2 plate of small tacos with a choice of pork or beef. And then it moves on to 8th Avenue and Brighton Beach and other areas of Brooklyn. Sunset Park's Bahn Mi in The Voice - Again. Food, food, food, and more food. That's what Sunset Park is made of. The Village Voice has the latest article about Sunset Park's offerings - and once again my favorite place for a sandwich and Lemon Ice gets attention. Walk north up Eighth and you'll come to Ba Xuyen, where you can find the best banh mi in the neighborhood (barely surpassing Tan Thanh's). There are also tasty salad rolls and fried spring rolls, and, in the self-serve warmer, you might strike it lucky and find banh beo—tiny, jiggly steamed-rice cakes, with various savory or sweet toppings. The other day, the cakes were crowned with a small dollop of mashed mung bean, fried shallots, dried shrimp, and ground peanuts. The prices of most of Ba Xuyen's drinks and breakfast sandwiches went up recently, but the Bahn Mi prices stayed consistent at $3.50. I'm glad for the businesses that they are getting all this attention, but I'm not so glad for my rent. I'm also not so glad because the lines have gotten a lot longer in the last five years. Hmph. Still, in the off-hours, it's not much of a wait. 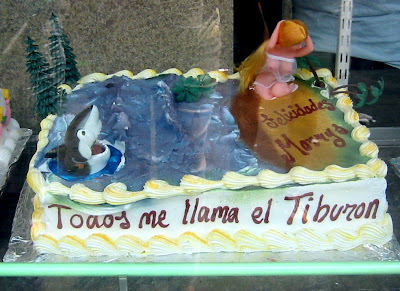 I'm surprised that the Tortas on 4th and 5th haven't gotten much attention. Granted, they are more expensive and not as big. For $5 at Don Paco Lopez (47th and 4th) you get a great sandwich, but for $5 at Ba Xuyen you get a great sandwich AND a Lemon Ice. Mmmmmm. Still, either way it's cheap. They painted the fence a (kooky) color - I call it Black Raspberry because it's the same color as the ice cream I used to scoop in my youth. I might not like it so much if I lived across from it, but I don't live across from it. They RE-painted the fence just a few days ago. It's not a new color; I guess the paint just needed a touch-up. It wasn't covered in graffiti or flyers. Strange, but fine with me. I've seen official-looking meetings of several people in hard-hats outside the fence. It actually seems like it's a project and not just a thrown-together, on-the-fly, make-some-quickie-cash venture. I've seen everyone working and interacting at this site. It hasn't (so far) seemed like a case of some guys sitting around with their coffees while others are doing the grunt work. As most of you have probably noticed, those groups tend to break-down based on varying shades of brown. There is an actual DOOR in the fence. It's not a swing-wide into the sidewalk and bonk passersby fence. It's a door, with a doorknob. Excellent. They didn't give up any information on what was going in there. I made the Condo Guess (due to the deep digging for what I assumed was a foundation and not a bunker). No response. I asked about whether it would have one or two commercial businesses on the ground floor. No response. At least the guy wasn't rude, just unresponsive. I'm suspicious that it's related to the building next door: a set of ill-fated condos, just around the corner from these other ill-fated condos. Either way, it's another something interesting to look at and watch on 6th Avenue. Lots of construction activity. My Spanish is anything but polished, but I think we're missing a letter N in the middle. However, that's not what drew me to this cake. At first I thought it was a mermaid, but then I realized it was just a naked lady in a netted sheath. I only took one photo, but there's also a little man inside the shark's mouth. This is such a fun cake - so much better than Sponge Bob and Dora and Mickey. It's in the window of Angel's Bakery at 39th and 5th. You can get a decent croissant with cheese there. For my cravings, however, I prefer La Gran Via's Pan de Zanahoria. The one without the frosting. So good. They also hand out samples once in a while. Even better! Labels: 5th Avenue, Brooklyn, Lost son, Queens, Woodhaven. It's close enough to warrant a walk-by, and the 69th Street Pier is always a sight. Hopefully the weather will be decent for the celebration. Beginning at 10 AM and continuing through to 6 PM, there will be green (is it capitalized now?) 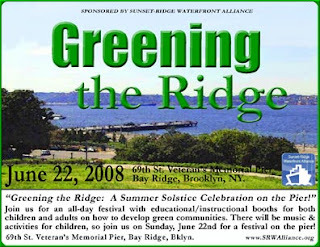 vendors, booths of green education, children's activities, and raffles. Local music, arts and crafts, and other activities will be going on. Get directions and check it out more details here. If it's not enough to hold your attention, just jog on over to Owl's Head Park and enjoy the views, playgrounds, and occasional whiff of refuse from the processing plant. Anyone who walks through Sunset Park can see that there will be lots of children in the area for years to come. Bulging bellies, strollers, overstuffed playgrounds - we've got kids. We've always had kids. Park Slope gets the flak about high-end strollers (that cost as much as a month's rent here, in some cases), but we have some strollers with two kids in one seat and another kid riding on the hood. That's how WE roll. "Four of the five elementary schools in Sunset Park are crammed beyond capacity, the report by city Controller William Thompson found. No new elementary or middle schools are planned, even though a nearly 5% enrollment increase is expected as soon as 2015." Sunset is certainly not alone in this. However, considering the amount of homes clearing out their "extra" apartments for renters and the glut of newly constructed condominiums and the cooperative apartments that are up for sale, it might be a lot sooner than 2015 that we see a jump in elementary school enrollment. Reading My Sidewalk Chalk, an informative blog about issues concerning education, I clicked on the link to the Comptroller's report about capacity in our schools. It's a PDF about halfway down this page. On pages 31-32 of the Comptroller Thompson's report, called "Growing Pains," Sunset Park gets a special mention. Ouch. With one elementary school at 123% capacity, another at 116% capacity, it makes P.S. 169 sound heavenly at 95% capacity...until you learn that P.S. 169 actually uses hallways as classrooms on occasion. (Perhaps capacity count is similar to real estate agents counting closet space and bathroom space as part of the square footage.) It goes on to point out that despite expected enrollment gains, NO NEW SEATS are in the 2005-2009 capital plan. Hmmm. Doesn't sound like Chancellor Klein is on top of things when he claims that the DOE doesn't wait until a school is overcrowded to plan new schools. Some of the problems that signal overcrowding are late-scheduled lunchtimes (sometimes as late as 1 PM) due to lack of cafeteria space and a gym "cobbled together from classrooms," which of course makes true gymnastics a problem. In P.S. 24, some kindergartners attend class blocks away in trailers parked in a middle school's yard. Also, P.S. 169 holds some classes in hallways. The Gowanus School (P.S. 172) has fantastic test scores - and the lowest enrollment. The remaining elementary schools have fair to middling test scores in reading and mathematics, with P.S. 169 boasting higher scores in mathematics. With the high need for English Language Learners in the area, the schools are asked to take on a lot more than the basic Reading, Writing, and Arithmetic - not to mention the music, art, and recreation times that have been sorely neglected by budgetary concerns. Quickie email form for Chancellor Klein. I may be a little behind on this, but I haven't gone up 46th Street for a while. But anyway, The New York Times Real Estate listing finally has the weird, skinny-looking layout condos on 46th between 5th and 6th Avenues listed as rentals. For just $2100, you can rent a two bedroom/two bath "condo wannabe" in trendy Sunset Park. Just up the block from La Salsa de Hoy, you can enjoy a common roof deck and separate bathrooms from your roommate(s) or loved ones. Pets are allowed. They really, really want to get some money back from this building. Make sure you get a two-year lease, however. The duplex apartments, and one smaller apartment, are still listed for sale. They run from $514K to $529K plus condo fees. Check out the largest unit here. Sadly, I had to leave at 8 PM, so if anyone heard the public comments, and if there was anything of interest, please send the information along to bestviewinbrooklyn (at) yahoo.com. While waiting for a quorum (attained at 6:50 PM), Randy Peers called up all interested residents to streamline the process. My concerns (stop signs for around the park and the recent gunpoint muggings) were referred to Jeremy Laufer, the district manager, and since he wasn't there, he'll be getting some emails/calls some time today or tomorrow. From the DOT: The Hamilton Avenue Bridge repairs will cause new lane configurations on June 28th, and the construction will (hopefully) be finished by August 31st. From the GreenMarket people: The Sunset Park GreenMarket will begin on July 12 and continue through most of November. It will open at 8 AM and continue through 3 PM. The GreenMarket is located at the same place as last year: 4th Avenue and 59th Street. They will accept food stamps, and some of the stands will accept WIC. All of the farmers will be local (500 miles), from NYS and NJ. 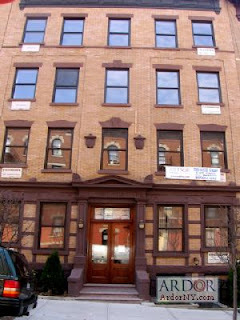 Call 212 788 7476 or visit www.cenyc.org for more information. From CB7: There are six new board members. Three new members were present: A lifelong SP resident, Glorisbel Garcia. She is a co-founder of Voices in Power New York, Inc., and she is attending law school; John Carollo, the Commerce Bank manager for the 4th Avenue and 39th Street branch; John Fontillas, a SP resident, an architect, and an adjunct professor at NYU. Not bad: Law, Money, and Development. And there are three more new members to contribute their expertise. Once quorum was reached, the agenda began. The first report was from Julie Stein-Brockway, the co-director of the Center for Family Life. But tonight she was reporting on the new Sunset Park High School. SPHS has been granted the right to have just one principal with three small learning environments. This constitutes a huge savings in administration costs, and it will allow for a more cohesive community in the school. The new school will be associated with the Institute for Student Achievement. She reported that construction is on schedule, and that the school will open in the fall of 2009. The Sunset Park High School is NOT included in the "big book of schools" that all the current 7th graders took home this week, so spread the word: Sunset Park High School is an option! There will be three groups of 100 9th graders accepted. In addition, 75-100 10th graders will be admitted. A principal has been selected from a large pool, although Ms. Stein-Brockway could not give out HER name. We do know that she is a former principal who now works with the NYC Leadership Academy. Sunset Park has waited a long, long time to have its own school. Hopefully the enthusiasm and hard work of the development team will come to fruition intact. The Buildings Committee reported on several sites, including 325 20th Street, which has an on-going investigation by the DOB, 562 62nd Street, 1216 Prospect Avenue, and 162 16th Street, where residents of the new condominiums have complained of water damage and black mold - already! Attendees brought up issues regarding 318 52nd Street, which has had a stop work order for months, and youngsters are using the wide open lot as a playpen. 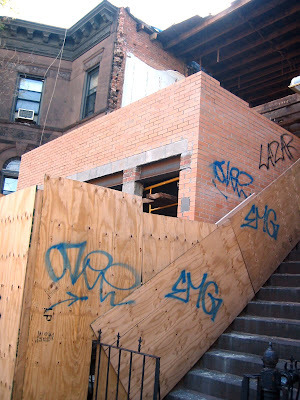 Another woman bemoaned the destroyed 6th Avenue brownstones. The Education Committee just wanted to remind everyone that the Brooklyn Prospect Charter school, set to open in fall 2009 with sixth graders, is open to ALL of district 15 - including Sunset Park! Students and families can find out more and apply here. A location has not yet been set, but since a partner is BAM, chances are it will be up near that area. The Health and Mental Health Committee is putting together a resource directory for caregivers to the mentally challenged. It will include a listing of services like in-home hair care (and at least two attendees offered to help out with that) and podiatry. This committee has decided to work and meet through the summer, so kudos to them! The Land Use Committee voted to support the application of a voting machine storage company at 5112 2nd Avenue. There will be no parking lost on the street due to this company; in addition, all loading will take place on their property, not on the street. And then it was 8 PM. Can anyone give more details regarding the later developments? Any corrections/additions can be sent to bestviewinbrooklyn (at) yahoo (dot) com. Thanks. Considering the number of times the fire trucks come up my street, it will be a vast improvement to have a double garage for the new firehouse. The plans have been in the works since 2005, and hopefully the rest of the development will go no without a hitch. See the rendering (and a photo of the old building) on Brownstoner here. Knitting in Sunset Park - any takers? 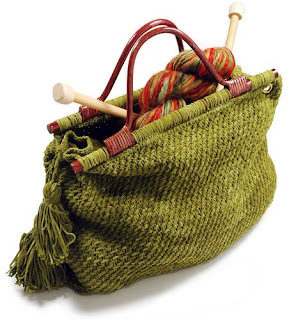 Brooklynian has a post asking about people interested in knitting and learning to knit. Considering recent developments in muggings, carrying some knitting needles around might be a good idea. Otherwise, it might just be a nice complement to the quilting group at the Recreation Center. Not to be Outdone: Beware of Gun-Toting Muggers in Sunset Park! Police are currently looking for information about a mugging on 6th Avenue and 44th Street. It occurred over the weekend, and it involved two men with a gun (or guns) holding up several other men at approximately 11:30 PM. Another mugging (the details are less clear) also occurred recently at about 11:30 PM on the opposite side of the park (41st, between 6th and 7th Avenues). The two incidents (or others that have yet to be reported) could be related. Anyone with information should call the 72nd Precinct at 718 965 6311. One poster mentioned that some of the actions could have a connection to identity theft, since none of the incidents followed "typical" mugging/robbery actions. So, sadly, beware of people being a little too friendly. Don't let anyone "watch" your stuff, don't let anyone get too close in the ATM vestibule, and avoid pleasant men who say hello and follow you. By the way, any trend like this can and should be reported to your precinct! So today, on my way to Three Guys from Brooklyn, I walked down Sixth Avenue from the park to 59th Street. Boy oh boy was there stuff to ponder. First, I noticed this yesterday, but two days in a row makes me curious. 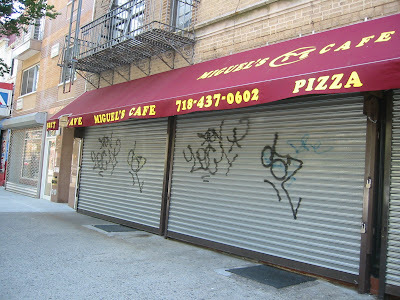 Why has Miguel's Cafe been closed up? There's no sign about a vacation or violations. When I called the number, there was no answer. Anyone know what's up? No work was going on, and it doesn't look like a lot of work has been done inside the building. Just orange brick jutting out from the front, so far. The description on the fence says that the first floor will be commercial, but neither of the stores that flank this building knew what kind of business would be joining them. 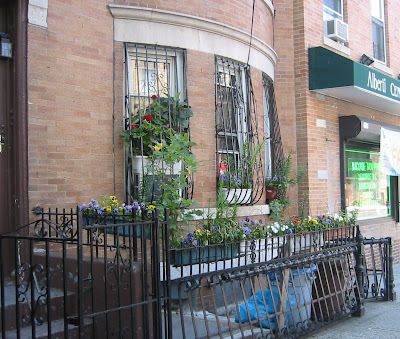 Of the five brownstones on the block, only two have been un-contaminated with storefronts. There is a grocery, a laundromat, and now a mystery store. Perhaps it will be a beauty salon? That seems to be the third prong in storefronts for Sixth Avenue. 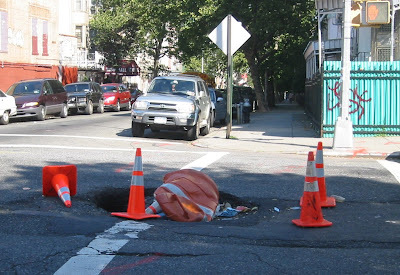 Then, as I continued along, I noticed a decent-sized sinkhole in the middle of Sixth Avenue at 56th Street. It is already filled with a garbage bag and several pieces of jetsam, including chunks of a book. It breaks my heart to waste reading material. The barrel left there for safety is now crushed, and the cones look like they're on their way out as well. At least it's in the middle of the street, I suppose. Drivers were using it as a chance to make very illegal moves around the intersection. In the 90 seconds I stopped there, I saw two almost accidents involving drivers who all knew THEY had the right of way. This particular location has had a few fill-in jobs already. I wonder how long it will be before a sink-hole large enough to swallow up a van will open up. Bay Ridge has had a few already. In more positive displays, the most pleasant windows of Sixth Avenue are in full bloom. There are also two bright green planters with additional flowers/plants in front of this house. The person responsible has kept this display up for many weeks now. The photo doesn't do it justice, and the flowers are a lovely way to get over the sink-hole and orange-brick feeling. There is no presentation tonight, so it's reports and then Public Comment. Could be a good night to speak up about issues that have been rattling around. This sign went up either late yesterday or early today around the Park. The reward is $100, but your Good Karma will go up to astronomical levels. The dog's name is Titi, and she has short, white, curly hair. There are a lot of dogs that look very similar to her around the park. If you've seen the dog, or if you have any information, please call the owners. A lost dog is heartbreaking! With support from the Brooklyn Arts Council, El Pequeno Artista presents a bilingual puppet show by Elisa Hevia. at 11 a.m., 1:30 p.m. and 4 p.m.
249 20th St. @ 5th Ave.
"Babysitting coops allow parents to swap babysitting services with other parents who live nearby. 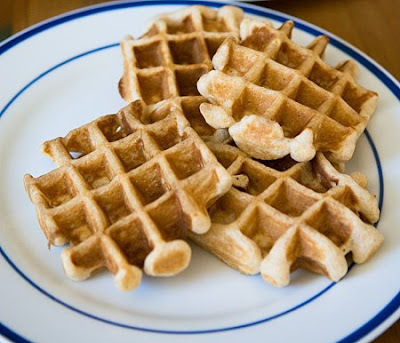 Vegetable Waffle facilitates coops by organizing information and providing a forum for requesting and offering babysitting. Members can find a babysitter using the master schedule and exchange points for babysitting services." To check out the website, to read about "How to Get Started," or to see the recipe for a Vegetable Waffle, visit the site here. A local yoga teacher will be holding an informal Hatha Yoga class on Wednesdays in Sunset Park. It will be an open-air class, and all levels are welcome. Time: Wednesday evenings from 6:30-8:00 p.m. Cost: $12 for single drop-in and $10 for each class when purchasing a 3 class card. Location: We will be practicing by the Sunset Park recreation center entrance, on the 7th Avenue side between the sycamore and oak trees. 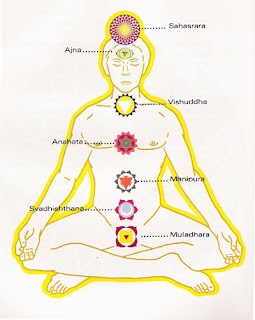 What to Bring: Please bring a yoga mat or blanket (for you ashtangis). Wednesday is supposed to be lovely weather at 74 degrees F. If it rains, the class will be cancelled. Between 1973 and 1976 Coleen Fitzgibbon made some of the most rigorous abstract films to date. This program revisits some of these early 16mm films from an artist who is perhaps best known as one of the co-founders of the alternative arts collective Colab. Films to be screened: Found Film Flashes (1973), FM/TRCS (1974), Internal Systems (1975), Restoring appearances to order in 12 minutes (1975), Document (1975-76). Coleen Fitzgibbon was active as an experimental film artist under the pseudonym "Colen Fitzgibbon" between the years 1973-1980. 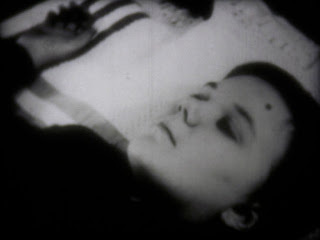 A student of Owen Land (aka "George Landow"), Stan Brakhage, and Michael Snow, Fitzgibbon screened her work at numerous international film festivals and museums, including EXPRMNTL 5 at Knokke-Heist in Belgium, Institute of Contemporary Art in London, Anthology Film Archives, Collective For Living Cinema, and Millennium Film Workshop in New York. The screening will be followed by a discussion with Coleen Fitzgibbon, moderated by Daryl Chin. 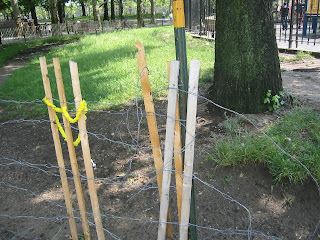 These fences were put up all over the park, ostensibly to assist the green spaces to become and remain green. Not the most successful campaign, as the photos show. Soon after they were erected, park-goers started removing the wooden pieces to play Light Saber Wars or Gawain Goes Beserk or something along those lines. 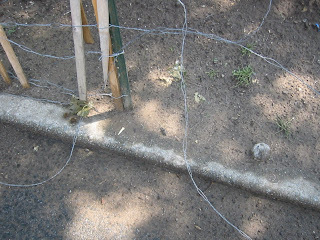 Also, the metal wire used to hold up the puny planks occ asionally fell apart and left one to two inch wire pieces all around the former fences. 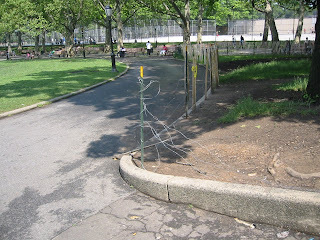 Now, a few weeks later, some of the metal wires have come undone, and the fence by the park-side entrance to the playground looks pretty scary. I couldn't find a park worker today, but it would be great if several people would mention this to Sunset Park employees. I don't want to bring a toddler to the emergency room with wire sticking out of his ear. I'm sure I'm not alone with that sentiment. Saturday will be a busy day in Sunset. In addition to the SPAN meeting, voter registration, the Relay for Life, and general fun in the sun, a major health fair with free services and activities will descend on the Sunset Park Recreation Center at 7th Avenue and 43rd Street. The Health Fair is sponsored by Project WAVE (War Against the Virus Escalating), Americorps Vista, and the National Association of Community Health Centers. Okay, so this isn't a Sunset Park issue in particular, but as a high school teacher, it's something close to my heart. When I taught Human Sexuality, it became abundantly clear that condoms were considered uncool, at least that was the public opinion. But you know what's even more uncool? Having to explain sores and smelly discharge and other fun developments to your intimate associate(s) - or worse, having to explain why your intimate associate (or more) now has said developments. When girls, in particular, asked me questions privately, it seemed like they wanted to use condoms, but they allowed the boys to convince them that they "knew what they were doing" and that they "were clean." So gullible, so trusting, so unsure. And it's not limited to teenage girls either. Get over it, people! If you want to play, use the right toys. And use them correctly. Maybe it's time for a Prophylactic Workshop at the Rec Center. Trojan will also send a free sample, if you wish. Gothamist has full information about today here. SPAN is an all volunteer group of neighbors committed to working towards creating a truly public process around the city's rezoning of Sunset Park and organizing around other justice-based issues. We make all decisions by consensus and welcome new neighbors to join. and 46th Street. On the agenda will be the rezoning campaign and the new proposed power plant. Register to Vote on Saturday from 1 PM to 4 PM. You can also change your registration, if you wish. Asian Americans for Obama will be signing up voters outside the Hong Kong Supermarket, 6013 8th Avenue. You don't have to be Asian, for Obama, or associated with the Hong Kong Supermarket to register. Click for more information. Register, go get some lunch, and then hang out in the park for a while. What's more citizen-like than that? I'll readily admit that I am slightly obsessed with the spaces left behind when the two residential homes at 713/715 43rd Street were demolished. It's been almost three weeks now, and nothing. No work, no activity, no action. Just a few half-hearted graffiti markings on the plywood and on the outer wall of the neighboring apartment building. 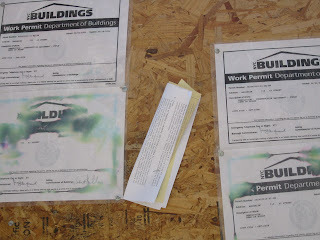 There isn't any work permit up other than the demo permits and sidewalk barrier permits either. However, this morning I noticed a note stapled onto the plywood. It looks fresh, but I couldn't see what the heck was on it. I also don't have the chutzpah to open it...that would be wrong. Do you know what it is? Maybe it's a START work order? Anyway, my curiosity got the better of me and I looked the (former) buildings up. The two lots have mortgages attached for 2 million. And they are slotted to become (surprise, surprise) commercial real estate. Now, they were last assessed at just over 600k each, so I guess the new owner (at 4205 8th Avenue?) figures sales will make a tidy profit. I doubt rentals would make-up for the cost any time soon. With the coops still selling for around 300k, will these do well enough to make it worth it? I can't wait to find out what is going on at my favorite empty lot. A few people complained that I haven't had any visuals for a couple of days. Well, here you go! 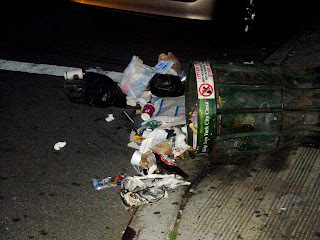 I snapped these photos on the way home from the Community Council Meeting last night. Why do people do stuff like this? The uninspired vandal has one thing going for him (okay, or her): a sense of symmetry. 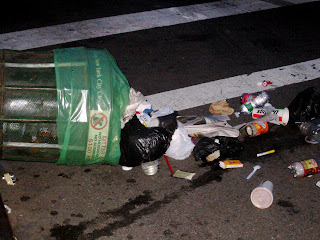 These garbage bins (it sounds so much more pleasant than trash cans) were on either side of 45th Street, providing us with matching street corners right by the train station. At the last Community Council meeting before the summer break, the turnout was great. Despite oppressive heat (and the lack of air conditioning in the Marien Heim cafeteria), many residents showed up to voice their concerns, questions, and thanks. The next Community Council meeting will be September 9th at 7:30 PM. National Night Out! will be August 5th, from 5PM to 7PM at Greenwood Playground. Volunteers are needed, so please call 718 965 6311 if you are interested. Police Appreciation Day is on June 21st from 11AM - 2PM at the 72nd Precinct. Come show the 72nd that we like what they do. Volunteers are also needed! Call 718 965 6326 if you are interested. The Boricua Festival is moving from Prospect Park to the 58th Street Pier this year. It will be on June 28th from Noon to 7 PM. The 5th Avenue Festival will be the 2nd week in September. So be ready for elote, lemonade, music, plastic stuff to buy, and trash. Captain Simonetti announced that arrests for robberies were up 500% in the last recorded 28 day period. This may have contributed to the lack of any reported robberies last week. He also presented the certificate for Cop of the Month to Muhammad Ahmed (who couldn't be there to accept because he was working! ); Officer Ahmed was responsible for at least four of those arrests - all in one night. Captain Simonetti also shared that out of six stolen cars, five had been left with the keys in the ignition - and running - while the owners quickly ran in to a store or to do a fast errand. Oh dear. Summonses will be issued if officers see unattended, running cars - saving us from ourselves! Graffiti removal has started up again. Call 311 to report graffiti for removal. If you see graffiti in action, call 911 to report it. A group of concerned parents and grandparents asked about follow-up to the 17th and 18th Street incident during which two young ladies were slashed. Captain Simonetti reported that there were six arrests made, and six additional young people were brought to the precinct as truants. In response to the incident, there will be a meeting for teenagers to combat gang initiation and related events. It will be at Trinity Lutheran Church at 46th and 4th. Details to follow. 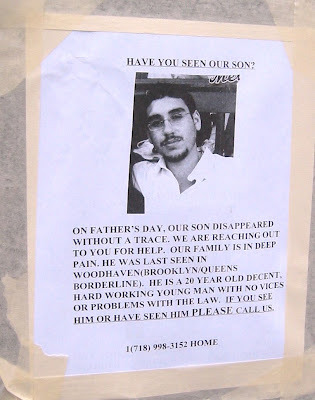 Two residents commented on the May 17th murder of Kyung-Sook Woo in Windsor Terrace. They appreciated the community meetings following the murder. One resident commented that the advice to report suspicious persons/activities was especially relevant because several members of the community had seen the man who was later arrested hanging around the dry cleaners. Captain Simonetti reiterated that 911 can be called in suspicious persons situations, and he thanked the detectives involved for their hard work. An arrest was made less than 72 hours following the murder. Several residents offered up information/questions about various issues including vagrants on the train tracks, tractor-trailers parking on streets for days at a time, large group of young people using a mother and her children as a buffer while walking down the street, and members of gangs hanging around PS 1 and play areas smoking illegal substances and having fights. Captain Simonetti answered a question about the gray area between 311 and 911 by explaining that suspicious persons on your block, looking into cars, or behaving in strange ways can warrant a 911 call. A passed out person on the street or in the park warrants a 911 call. The incident where a woman was being used by teens as a shield could be a 911 call. 311 should be used for nuisances and quality of life issues. We can also call the Community Affairs office at 718-965-6326 to report QoL issues. The phone is attended until 10 PM. The meeting ended with a reminder that fireworks are illegal. Not only are they a personal safety issue, but they are also a fire hazard. Don't burn up my apartment for your fun, right? The officers were immediately surrounded by residents who wanted to offer congratulations or ask more personal questions to the officers. that (alleged) perpetrator, but THREE MORE robbery suspects as well. Four arrests in the same night. Well done, Officer Ahmed! Perhaps his efforts, along with the other officers in the 72nd, contributed to last week's lack of robbery complaints. Not one the entire week. Pretty darn cool. Besides the long-ago begun hotel on 39th Street and the lovely Days Inn on 39th between 4th and 5th Avenues, there are rumors about a hotel development going in on 3rd Avenue and 49th (? ), and even over be the 59th express train. And now, according to Brownstoner.com, 33rd Street between 2nd and 3rd will get its own hotel. I know the jail uses up a lot of current hotel space, but the Days Inn isn't so much cheaper, and I've heard the rooms are tiny. I'll be curious to see what a types of establishments show up. Will we get a Hotel Le Bleu? Now THAT would be something. But where will they find nice neighbors like the taxi depot? 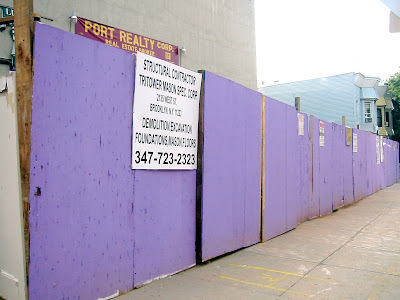 At 6:30 PM on Wednesday, June 11, CB 7 will hold a public hearing at 4201 4th Avenue (entrance on 43rd Street). Agenda items include the disposition of city-owned property within the Bush Terminal industrial complex, and an application to use a property on Second Avenue as a warehouse facility. For more information, contact the board’s office at (718) 854-0003. Just as it occurs every 2nd Tuesday of the month, the 72nd Precinct Community Council Meeting will be at 7:30 P.M. at the Mariem Heim Center at 4520 4th Avenue. Today we lose a fantastic Sergeant. Sgt. McGoey is turning in his badge today and retiring. The New York Times has an article about the 72nd Sergeant's career, all but eight years were right here. Sgt. McGoey was at the CB7 public hearing about Tacos 2004 and its desire for a renewed liquor license. After giving his report, he stayed for the entire meeting because residents has additional questions. Solid community relations, that is. The photo is from Christian Hansen of the NYT. I'm going to do the lazy thing and put up two links from Gowanus Lounge instead of posting my own photos. These are much better photos anyway. I wish I'd gotten some of the mega-bbqs I saw in the park yesterday. Quite the set-up for some parties. Portraits, Textiles, Odd Fellows, and Renegade Treats will be available for your enjoyment at Light Industry this Tuesday evening at 8 PM. 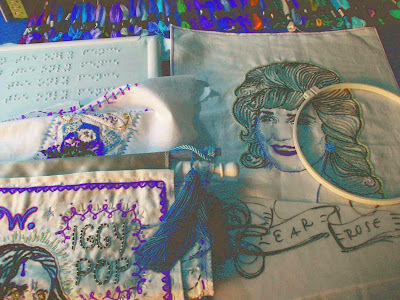 Tomorrow's installment is "No Idle Hands," curated by Sabrina Gschwandtner. What follows is the description of the event according to the Light Industry email. For more detailed descriptions, go to their website. Tickets - $6, available at door. Handcraft--absorbing, obsessive, mysterious, political, communal and mythical--is the subject of these documentaries, which range from exhaustively researched to casually recorded and even imagined. The screening will be followed by a Q&A session with Faythe Levine, Elaine Reichek and Cecilia Vicuña. Being the natural nerd that I am, I can't help you with your Hipster Coolness Quotient. Sorry. However, a friend has been having trouble dealing with the heat sans Air Conditioning (this weekend is ROUGH! ), and I thought I'd pass along ideas and some links that have pretty decent tips. For daytime, I always carry my fan from Granada. I love that thing. I like to pretend I'm still living in Spain and stick the handle in my bra strap like the Abuelas did. However, you can also pick one up from any HealthPlus kiosk, or any place that's handing out free stuff, really. They are also quite effective - although they aren't as easy to stick in a bra strap. Also for daytime, the playgrounds with water features should be squirting the water any day it's over 80 degrees Fahrenheit. I believe they are supposed to stay on until dusk. 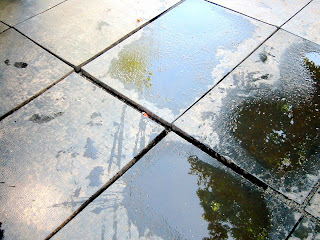 Rappaport (toddler friendly), Owl's Head, Sunset Park, and Slope Park all have water features. Garfield is great for toddlers, but it's farther away. Obvious solutions for daytime also include visiting Atlantic Center (or your grocer's freezer section) and using their AC. The grocery can get a little awkward after a while, however, and any children you have with you will get very restless. Atlantic Center (notice the initials) is better because you can move from one large consumer delight to another. The library works too, if it's open. For sleeping, you need different ideas. I love fans. I didn't have an AC for a long, long time, and my standing, oscillating fan still allowed me to sleep. No, they don't lower temperatures, but it sure feels good. Also, cooling off the inside of your wrists works really well. That and the temples. On really bad nights, wet your head. Those of us with lots of hair can benefit from this longer, and I suggest a towel or two under your head. Your pillow may suffer, but it works. The deadline is June 15th, so if you want $1,000 and more knowledge about how to care for newer and older trees on our streets, get going with your application! The workshops cover how to water the trees properly, building partnerships in the neighborhood, and project planning. 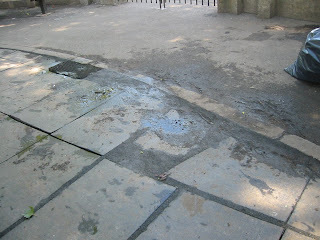 Maybe they will address how to keep people from using the trees and their roots as doggie toilets and waste bins. I even saw some kids using the baby tree outside for a pole dance. Too bad "Respect for Mother Nature 101" isn't mandatory for maintaining citizenship. Even though the ticker on the website is still just under 82 thousand trees, it seems that the City is serious about its Million Trees Campaign. If you can't/don't want to apply for the grant, here are some tips from the Campaign. If you've ever dreamed up a project to take care of the neglected street trees in your community, if you've ever sat around thinking of creative, long-term, community-based solutions to educate and get others to dig in and help–it's a great time to turn those ideas into reality. Join a group of like-minded people in our new program, Partnerships Academy: Street Trees! Applications are due June 15, 2008. Sessions will be led by Partnerships for Parks and feature experienced tree stewards and MillionTreesNYC partners. Topics will address challenges such as watering, strategies to build relationships in the community, and project planning. For details, see www.PartnershipsForParks.org or call (212) 676-1929. 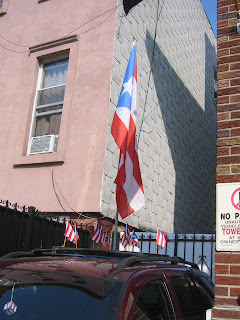 It seems there is a lot of disbelief when it comes to those who claim that a decent amount of Puerto Ricans still live in Sunset Park. 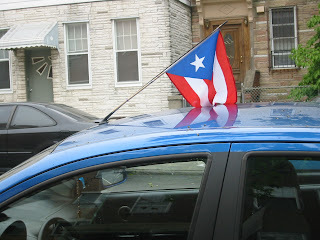 Not every Boricua has left yet. In fact, many homeowners want us to know that they are still here. 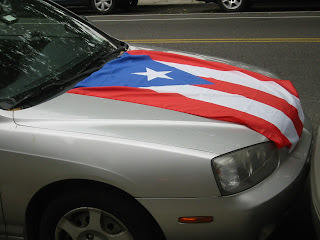 Besides several in-front-of-the-house booths selling beads and flags and patches and coqui items, a lot of ho mes and plenty of cars have been adorned with the other red, white, and blue. If you want to purchase PR Parade gear, check out 47th Street close to 6th, 44th Street close to 5th, and a roving retailer on 5th Avenue around the high 30's. Honestly, the coolest thing about the whole NYT climb yesterday is this photo taken by Nicholas W. Skyles, who works at the New York Times building. I'm not a big fan of people who risk their own lives and the safety of others to bring attention to a cause. I know, I know. We're supposed to love risk-takers and admire their cojones and all that. Well, I don't. In fact, I wouldn't even bother mentioning it except that the second guy was from....you guessed it....Sunset Park! He's in Bellevue now, but usually he lays his brave old bod right in our neighborhood. You can read all about it in the NYT version of the story. Now, Malaria No More is a worthy cause. No one would dare dispute that. And bringing attention to Global Warming is important as well. But it's not as though either of these issues is obscure or neglected. I mean, Malaria No More even has Jordin Sparks singing to our current fearless leader in its name. Not only did Idol Gives Back contribute to it, but ExxonMobil is a partner as well. Yeah, this organization really needs help. Bring it home, Reynaldo. Check out Neighbors Helping Neighbors or the Center for Family Life. I'm sure you can think of some interesting stunt to bring attention to these worthy organizations as well. Anyway, of course the second climber, who reached the top despite some wiggles and wobbles, was from Sunset Park. I wonder if he lives around 18th Street? Or would Park Slope want to claim him then?